This week we’re hearing about the effects that climate change can have on fragile and native populations. Guest speakers Salote Soqo and Patricia Cochran will address their experiences on the front lines of climate action in the South Pacific and Alaska. Salote Soqo- Senior Program Leader of Environmental Justice & Climate Action with the Unitarian Universalist Service Committee (UUSC) focused on advancing and protecting the rights of peoples displaced by climate change. Salote is a native of Fiji, an island in the South Pacific that is experiencing forced displacement of coastal and rural communities as a result of rising seas, natural disasters and increased temperatures. Her program focuses on lifting the voices of communities that are most at risk to this issue by providing them with resources and tools to empower and protect communities and to defend their inalienable human rights and human dignities. Patricia Cochran- an Inupiat Eskimo born and raised in Nome, Alaska. She serves as Executive Director of the Alaska Native Science Commission (ANSC), a public, not-for-profit corporation. 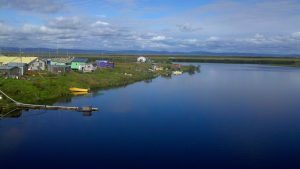 The ANSC provides a linkage for creating partnerships and communication between science and research and Alaska Native communities. Ms. Cochran previously served as Administrator of the Institute for Circumpolar Health Studies at the University of Alaska Anchorage; Executive Director of the Alaska Community Development Corporation; Local Government Program Director with the University of Alaska Fairbanks; and Director of Employment and Training for the North Pacific Rim Native Corporation (Chugachmiut). RECORDED: Tuesday, June 6th, 2017 at Williwaw.